Tackle the expressive phrasing and minor pentatonic tricks of one of rock's finest guitarists, David Gilmour. 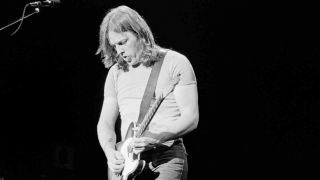 "David's smooth and perfectly-intonated bends are present in almost every solo"
At the heart of David Gilmour's playing is some very soulful blues vocabulary with precise string bending, awareness of space and rests, lyrical vibrato and excellent intonation. His famous two-step two-tone bend can be heard on anything from Shine On You Crazy Diamond to Another Brick In The Wall (Part II). Bluesy diads, slides and quarter-tone blues curls are evident in tracks such as Money and Comfortably Numb. David's smooth and perfectly-intonated bends are present in almost every solo, but particularly good examples that use a nice wash of delay can be heard in What Do You Want From Me and Hey You. The key here is not bending too sharp. The bends should sound lazy and slightly out of tune to create a laid-back bluesy tension over the D minor backing. David borrows typical blues phrasing from greats such as BB King and Albert King. The blues lick starts an eighth note before the first full bar of music. Try rotating your fret hand to the side to execute the quarter-tone bend. The rest of the notes come from the D minor pentatonic scale. Practise the three-semitone bend by fretting the 18th-fret second-string F note first. This will attune your ear to the target pitch. Gilmour's trademark bend is played in two stages. First, bend up a full tone, then release slightly just before the final push up to the full two tones. Try hybrid picking if you're getting note bleed between the two strings: pick the second string with your pick and the first string with a finger. The typical blues/jazz rake spells out a D minor arpeggio and still stays within the familiar territory of a minor pentatonic 'box' shape. Getting comfortable with Gilmour's use of multiple scale positions will further your understanding and freedom in terms of improvising.